The interaction between accounting, company law, and taxation is a key issue in corporate regulation. These three areas have differing kinds of regulations with different objectives and varied techniques of regulation and interpretation. Moreover, views on all of these factors vary from country to country. How these fields interact has significant ramifications. It affects the future development of both accounting regulation and tax law and raises the possibility of international double taxation. These potential effects suggest the need not only for better analysis in this area but also for a harmonised international view. 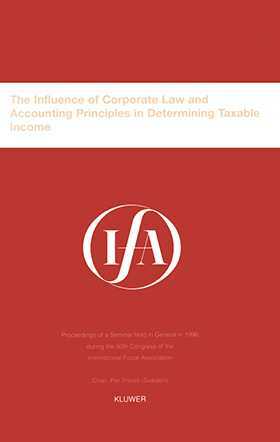 The Influence of Corporate Law and Accounting Principles in Determining Taxable Income takes a thoughtful look at several components of this key debate. The papers included offer insights into the different paths taken on the various issues by selected countries, cites problems, and offers proposals for the future. Tax and corporate law practitioners, policymakers, and academics will appreciate the insightful and thought-provoking quality of this work.